After four rounds of the National Open (June 7-11, Las Vegas) only two players have a perfect 4-0 score: IM Reiner Gonzalez from Miami and GM Atanas Kolev from Bulgaria. In round 4, Josh Friedel fought very hard against Atanas Kolev from a worse endgame but Kolev finally got the better of him. Gonzalez defeated the Georgian GM Merab Gagunashvili in an endgame that at first seemed very even. However, once the bishops were traded, and Reiner secured the d4 square, he had a winning edge. Viktor Korchnoi recovered after his first round accident and has 3.5/4. In round he dispatched GM Dashzegve Sharavdorj with impressive isolated queen pawn play. 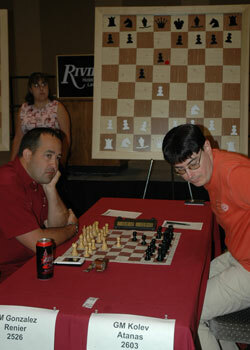 U.S. Champion Alexander Shabalov faltered with his pet Sveshnikov in round three against Melikset Khachiyan. The friendly Aremenian-born Californian showed how to use a queen to dominate two rooks.